This dress has a white twinkle satin bodice with hot pink embroidery and a hot pink soft skirt with layers of finely pleated ruffles. 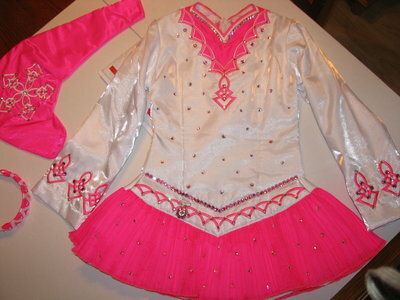 It has a hot pink shawl with white embroidery. It is covered in hundreds of Swarovski crystals. Matching hot pink/white headband with Swarovski crystals is included. Asking Price: $US800.00. Shipping costs are not included in the asking price. Returns are negotiable.